Sports franchise partners with Cisco on digital transformation. Major League Baseball's Atlanta Braves, which lays claim to being the oldest continuously operating professional sports franchise in the country, shared its digital transformation story this week at Cisco Live, the vendor's annual customer and partner event taking place this week in Orlando. The Braves play in SunTrust Park, a 41,500-seat ballpark nestled within The Battery Atlanta, a 1.5-million square foot mixed-use development in the heart of the city. Multiple hotels; office buildings; residential, retail, and restaurant/bar properties; and a 4,000-seat music venue also reside in the Battery, which the Braves own. In developing the Battery and SunTrust Park, the Braves organization wanted to create a modern, digital experience for the millions of visitors it receives per year, said Greg Gatti, VP of IT and CIO of the Braves. Gatti provides an overview of the team and its digital transformation project in the video below. Ultimately, the Braves wanted to create the most technologically advanced sports venue in the world and deliver a unique fan experience, and it decided Cisco was the best partner to help it achieve its mission, Gatti said. The Braves have gone all-in with Cisco, deploying its data center, enterprise networking, security, and collaboration products, as well as relying on its digital solutions and professional services. For communications and collaboration, as shown below, the Braves organization is using an IP phone system and Unified Contact Center Express products. In addition, the Braves organization relied on Webex for regular meetings between project leaders and external resources as the project progressed, Gatti told me. 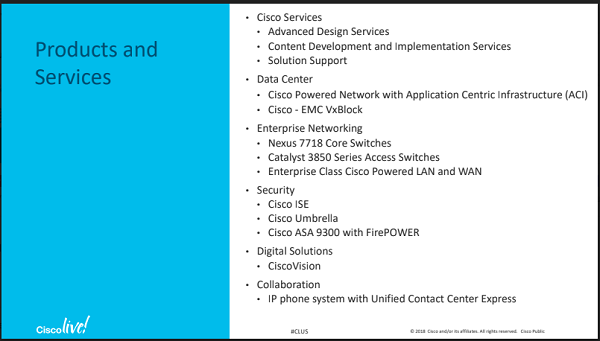 Cisco's Advanced Services team did much of the heavy lifting for the contact center deployment, helping with CRM integration -- a key component of delivering that exceptional customer experience the organization sought. "With Cisco sitting at the table, we were able to talk about doing new things," Gatti said. "Forget what you have on your 15-year-old phone system and think about what you want to do." The Braves did encounter bumps in the road as things unfolded, of course, Gatti said. "But the biggest unexpected problem we encountered was not with technology, it was with construction." In particular, the organization ran into trouble with conduit, with electricians falling far behind schedule. "Everything is network-driven," Gatti said, "and if you don't have conduit, you can't run cables." Nevertheless, the Braves pulled off the transformation just in time, bringing on roughly 50 additional heads to help with laying conduit and bringing the network up in time for the official opening of the 2017 baseball season. The project resulted in several notable outcomes, Gatti said. The organization was able to create a new revenue stream through digital advertising, video, and interactive kiosks on more than 100 dedicated HD displays. The franchise generated a seven-figure annual ad revenue stream from its 1,350 displays scattered throughout SunTrust Park and the Battery Atlanta, he noted. Additionally, the organization accomplished its one-network concept, supporting hundreds of critical business applications while providing fast Wi-Fi speeds across the stadium and the Battery to the more than six million people who visit annually. In addition, the Braves simplified network management, enabling IT to support and manage nearly 10,000 ports with a team of only 18 people, Gatti said. The project has transformed the business, as well, he added. The Braves went from being a professional sports franchise to landlords of a large-scale mixed-use development, with hundreds of tenants operating year-round. Think of the Braves not just as a sports organization, but as developers, a landlord, and a digital marketing company, Gatti said. And as shown in the video, SunTrust Park and the Battery complex has become a model for professional sports organizations looking to provide their own modern, digital experiences.